Observation - kitenet - Garden Spider - 14 September 2008 - 10:30pm - UK and Ireland. 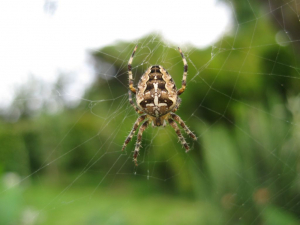 Description: This is a female Garden Spider, Araneus diadematus, whose large orb webs are currently a feature of many gardens. The diadematus bit of the name comes from the cross shape made by the white marks on its abdomen. This is a female Garden Spider, Araneus diadematus, whose large orb webs are currently a feature of many gardens. The "diadematus" bit of the name comes from the cross shape made by the white marks on its abdomen.